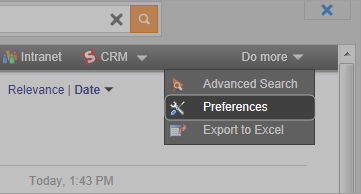 In the Coveo .NET Front-End default web search interfaces, you can click the Preferences link above the search box to access the Preferences page where you can customize the way results are queried, displayed, and opened. These preferences apply to each user individually. Note: The Preferences link is optional and can be disabled by your Coveo administrator (see Activating Search Interface Options With the .NET Interface Editor). The Coveo administrator can also centrally manage default preference values but these changes do not affect your customized preference values (see Modifying Default .NET Search Interface Preferences). With the default web .NET search interface, click Preferences appearing below the search box. With the Desktop Searchbar, on the Do More menu, click Preferences. In the page that appears, adjust the desired parameters described in the table following the figure. Specifies the number of results that appear on each search results page. Specifies the number of lines to include in the text excerpt for each result. Type the desired default mailbox. When selected, specifies your default mailbox as the active filter for the Mailbox facet. Select this option for the My Email .NET search interface. When cleared, the Mailbox facet shows all mailboxes to which you have access. When selected, documents that you open from search results appear in a new browser window. When cleared, the document you open appears in the same browser window as the search results. When selected, interprets * and ? characters as wildcard operators (see Using Wildcards in Queries). When selected, checks if keywords in your query have synonym entries in the thesaurus, and when they do, adds the synonyms to the query (see What Is the Thesaurus?). When selected, automatically corrects misspelled keywords in your query before sending the query to the index server. A message appearing at the top of the search results indicates that the query was corrected (see How Are Misspelled Words Handled?). When selected, emails that you click from the search results open in Microsoft Outlook. When cleared, clicking an email rather opens the Outlook Web App (OWA) dialog box to allow you to open the email from anywhere. Note: With Outlook 2007 and up, the outlook:// protocol used by the Coveo email links is disabled by default. Network administrators can enable the protocol globally on all workstations (for example using GPO). When the links do not open in Outlook 2007+ on your Windows workstation, you can enable it by yourself or with the assistance of an administrator (see Shortcuts and the Missing Outlook:// Protocol). Note: Preferences are stored in your browser cookies. They are therefore only available with this browser on this computer. They will be lost if you clear your browser cookie memory. Click Hide Preferences at the below the search bar to close the page.